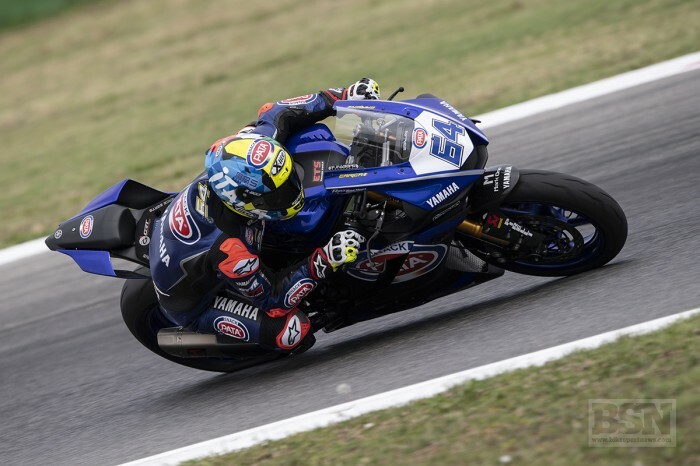 Federico Caricasulo (GRT Yamaha Official WorldSSP Team) went from pole to the race winner at Misano, after overcoming the early leading challenge of Jules Cluzel (NRT Yamaha). He ended up with a margin of victory of 1.423 over Raffaele De Rosa (MV Agusta Reparto Corse by Vamag). Second was De Rosa’s best result so far. New championship leader Sandro Cortese (Kallio Racing Yamaha) was third. Cluzel, losing pace as the race went on, scored fourth place but was over seven seconds back on the winner. In the championship Cortese now leads Cluzel by five points. Early leader Cluzel was passed by first Caricasulo and then De Rosa. Lucas Mahias (GRT Yamaha Official WorldSSP Team) had a spectacular and painful highside as he and De Rosa challenged on lap two. The 2017 champion got back on but did not finish the race. In fifth place Randy Krummenacher (BARDAHL Evan Bros. WorldSSP Yamaha) was over 13 seconds back, having to work to keep Anthony West (EAB antwest Racing Kawasaki) behind in the final laps. West also had his work cut out to keep sixth place, with Kyle Smith (CIA Landlord Insurance Honda) top CBR rider again and right behind him across the line after 19-laps. A three-man warring battle for the final positions inside the top ten saw official rider Hikari Okubo (Kawasaki Puccetti Racing) eighth, Ayrton Badovini (MV Agusta Reparto Corse by Vamag) ninth and local wild card Lorenzo Gabellini (GAS Racing Team Yamaha) tenth. With eight rounds gone, Cortese has 138 points, Cluzel 133, Krummenacher 116 and Caricasulo 104.